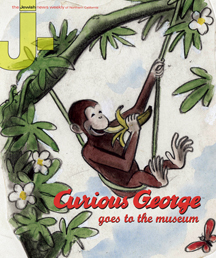 Curious George goes to the museum – J. “Hurray for Curious George!” is an exclamation that introduces a 400-page book containing all seven “Curious George” stories, published this year in honor of the mischievous little monkey’s 70th anniversary. But it’s also a phrase that could have been shouted by the series’ German Jewish creators, the late H.A. and Margret Rey, after they fled the Nazis in 1940. For it was their impish protagonist — or, more accurately, a Curious George manuscript in their suitcase — that quite possibly saved their lives. The exhibition, which will run through March 13, 2011, not only showcases the well-known pictures of Curious George and the Man in the Yellow Hat, but it also examines the parallels between the Reys’ children’s books and the obstacles they faced in their lives. The story of the Reys’ life in France and incredible escape — just two days before the German army rolled into Paris, they pedaled out of town on bicycles and headed south — is told through an interactive timeline. In addition, the CJM will offer activities that illustrate one of the exhibit’s themes: the importance of a person’s journey, from their family’s origin to their current location. 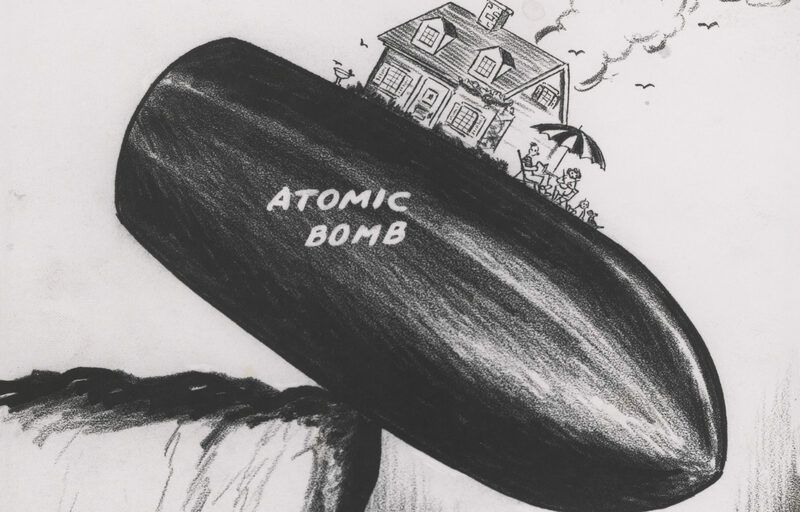 The exhibit includes nearly 80 original drawings of the beloved monkey and other characters, sketch books and vintage photographs, as well as documentation related to the Reys’ escape from Nazi Europe. “Curious George Saves the Day” made its debut at the Jewish Museum in New York this year, running from March through August. The exhibit is whimsically housed beneath replicas of two of the Reys’ residences: an arched, green-shuttered pink residential hotel in Paris and a bright-blue house in Cambridge, Mass., where they relocated from New York in 1963. The art and documentation in each section mirror the couple’s surroundings on various legs of their journey, from correspondence to friends detailing their escape from the Nazis, to watercolors and photographs displayed on yellow walls (a color match with the books’ famous yellow hat). To acquire material for the show, Claudia Nahson, the Jewish Museum’s curator, made several trips to Hattiesburg, Miss., the home of one of North America’s leading research centers in the field of children’s literature, the de Grummond Children’s Literature Collection. She combed the facility’s extensive archives, looking for pieces that would simultaneously captivate visitors while also paying homage to the Reys’ getaway from the Nazis. In 2005, author Louise Borden performed a similar task to complete her book “The Journey That Saved Curious George: The True Wartime Escape of Margret and H.A. Rey.” Intended for children ages 9 to 12, her book tells of the Reys’ globetrotting adventure, which began in Paris just before the Nazi invasion. During her research, Borden not only dug through the archives, but also interviewed people who knew the Reys and traced their journey through letters and postmarks. In creating the exhibit, Nahson focused on any art that was a result of that journey. After fighting for his native Germany in World War I, H.A. Rey (born Hans Augusto Reyersbach in 1898) moved to Rio de Janeiro in the mid-1920s. He became a salesman in the Amazon, where his love of animals compelled him to adopt a pair of monkeys as pets. Margret (born Margarete Waldstein in 1906) was a German photographer and artist who moved to Rio, by way of London, looking for adventure, work and a chance to reconnect with H.A. They had known each other Hamburg, their hometown. The couple married, became Brazilian citizens and headed to Paris for their honeymoon in the mid-1930s, with the intention of staying just a few weeks. They ended up staying for more than four years. In September 1939, the Reys sought shelter at Chateau Feuga, an old castle owned by friends in southern France. As German nationals (with German accents) living in France, they had become subjects of suspicion. A tip from villagers led French authorities to the castle, where a search turned up drawing boards with pictures of the playful monkey. The images helped convince the authorities that the Reys were not spies. They were left alone. Around that same time, H.A.’s animal drawings caught the attention of a French publisher, who commissioned him to write a children’s book in 1939. The result, “Raffy and the 9 Monkeys” (Raffy was named Cecily G. in the U.S. version) is little remembered today, but one of its characters, an adorably impish monkey, was such a success that the couple considered writing a book solely based on him. Ellen Ruffin, curator of the de Grummond Children’s Literature Collection, loves this debut of the now-famous Curious George. His mischievous nature and playfulness emerge early, she said, such as when he and other monkeys use a giraffe’s neck as the mast of a sail to navigate across the water. The Reys returned to Paris in January 1940 and published “How Do You Get There?” one month later. The book asks readers to lift the flaps of each illustration to reveal how characters get from one location to another. If you need to get to a lighthouse, you take a boat. If you are going away, you hop on a bus. H.A. supplied the art and the basics of the story. Margret spun it into a full plot. In June 1940, with the German occupation of Paris imminent, the Reys left town on the first phase of an arduous journey. The pair traveled on makeshift bicycles for four days before reaching France’s border with Spain, then took trains and ships en route to their desired final destination: New York. The trip was treacherous at times, particularly on a Lisbon-bound train when an official suspiciously eyed the Reys and demanded they open their satchel for inspection. Once again, it was drawings that helped substantiate their innocence, and the Reys were allowed to continue on their way. They arrived by boat in New York City in October 1940, and eventually published the tale of Fifi, who was renamed George. The duo also published “Spotty” in 1945, an Ugly Duckling–inspired tale about a spotted bunny who abandons his unspotted family, only to meet a plain bunny in the same predicament. When the two bunnies’ families meet, they realize they are all the same. That story paralleled the German Jews’ experience at time, being forced to flee because of their differences. U.S. Army posts in Germany after World War II used “Spotty” as a tool to educate children about discrimination. “Curious George” was an instant success when it was first published in 1941, and the Reys were commissioned to write more adventures of the puckish monkey and his friend, the Man in the Yellow Hat. They wrote seven Curious George stories during their lifetimes, with H.A. mainly drawing the illustrations and Margret working mostly on the stories — though they both admitted to sharing the work and cooperating fully in every aspect of development. The first “Curious George” begins in the jungle, where the Man with the Yellow Hat baits George in his broad-brimmed accessory. The pair arrives in the United States, where George’s antics are many. He inadvertently calls the fire station and is put in jail — of course, he escapes. Outside the jail, he spots a balloon salesman and tries to grab one balloon, only to end up flying into the air when he grasps them all. In 1947 came “Curious George Takes a Job,” in which George snatches the keys from an unsuspecting zookeeper to escape the confines of his cage. He then hops on a city bus and ends up at a restaurant, where he gets tangled in a plate of spaghetti. In 1952’s “Curious George Rides a Bike,” the Man with the Yellow Hat buys his monkey a blue bicycle. George can do all kinds of tricks, and he befriends a boy on his paper route. But kids playing with toy boats at a nearby stream easily distract George, who forgoes delivering the newspapers and makes a fleet of paper boats instead. In 1966, the year the final book in the series, “Curious George Goes to the Hospital,” came out, Lena de Grummond, a library science professor specializing in children’s literature, contacted H.A. and Margret about the University of Southern Mississippi’s new children’s literature collection. She was willing to take anything, including editorial notes, sketches and color separations. At the time, the Reys, then in their 60s, made a formal donation of a pair of sketches. As the years passed, de Grummond continued to receive donations as she nurtured her relationship with the couple, and specifically Margret after H.A. died in 1977. Then in 1996, after Margret’s death, it was revealed in her will that the Reys’ entire literary estate — a “rich archive,” Ruffin said — was to be donated to the literature collection. Ruffin has been curator there for about five years. When asked why people still embrace the “Curious George” tales, she attributed the books’ popularity to their broad audience appeal. The Contemporary Jewish Museum doesn’t want the monkeying around to stop at the exhibit. For starters, several activities have been planned in conjunction with the opening of “Curious George Saves the Day: The Art of Margret and H.A. Rey” on Sunday, Nov. 14. Members of the museum are invited to a bagel and banana brunch from 11 a.m. to 1 p.m. There also will be a performance by an all-female clown troupe called Circus Finelli and a chance to meet a special, costumed character (hint: he’s mischievous and has a tail). RSVP is requested by visiting www.thecjm.org or calling (415) 655-7837. 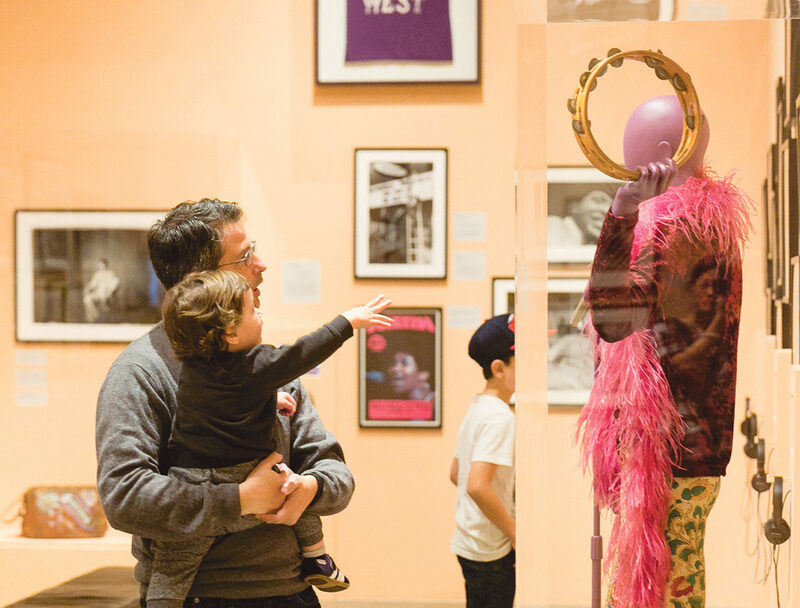 On Dec. 4, the CJM will host “Get Curious!” The festive party for families will include a circus performance by Sweet Can Productions and interactive beat-boxing with Bronkar Lee. Guests can make their own kites, view the exhibition, celebrate Chanukah and dance the night away. Festive attire is recommended for the party, which kicks off at 5:30 p.m. at the CJM. For members, cost is $100 for adults and $50 for kids; for the public, it’s $150 and $75. For information and tickets, visit www.thecjm.org, call (415) 655-7836 or write to ssilver@thecjm.org.